I was playing yesterday with my tissues and serviettes, and this page emerged! Aren't serviettes grand to play with? just glue and tissue...how freeing is that?!? I used about six different serviettes (parts of them). 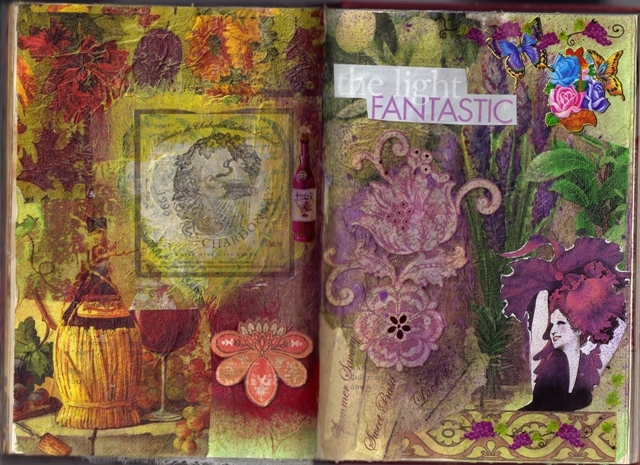 The image (wine label) on the left page is a transfer using clear mactac. Your work is gorgeous. I love it all! Wow! Love the colours, the design, everything! Gorgeous!